Thanks bestwebsoft team, easy and flexible. 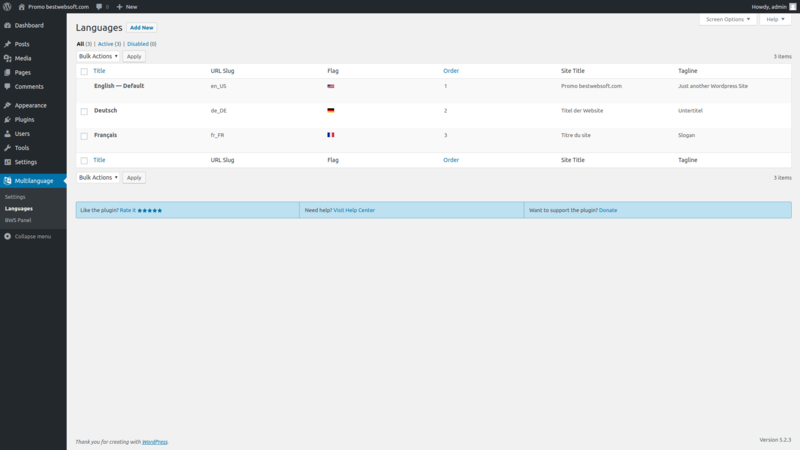 Multilanguage plugin is a great way to translate your WordPress website to other languages. 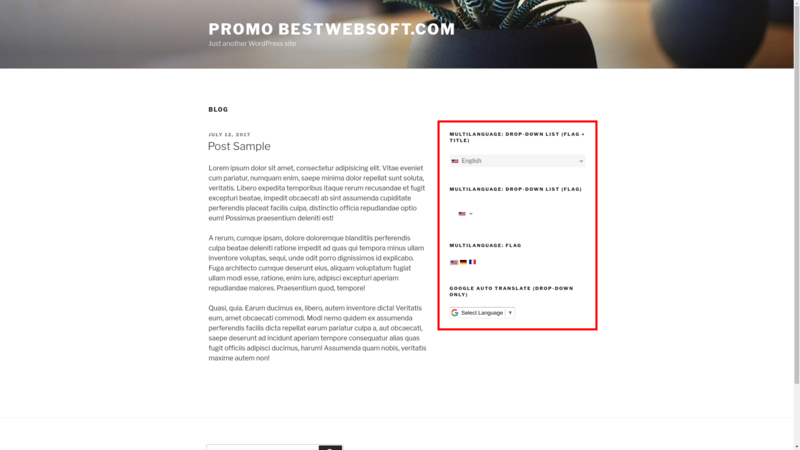 Add translated content to pages, posts, widgets, menus, custom post types, taxonomies, etc. Let your visitors switch languages and browse content in their language. Create and manage your multilingual website today! They supply great customer service, I got a few (personal) answers from them for features I wanted to implement although I am not a paying customer! Simply awesome, does its job perfectly, no problems at all! It`s very easy to use and edit! I love it! Cheers! *Bugfix : Plugin optimization has been completed. *PRO : Bug related to the custom fields was fixed. * Bugfix : The compatibility with WooCommerce has been improved. * Bugfix : The bug with paragraphs was fixed. * Bugfix : Bug related to the incorrect homepage URL has been fixed. * NEW : Ability to translate Open Graph metadata has been added. * NEW : Ability to translate post category and tag descriptions has been added. * NEW : Google Auto Translate switcher type has been added. * Bugfix : Bug with broken redirection connected with SSL has been fixed. * Update : The compatibility with WooCommerce has been improved. * Update : Spanish language file has been added. * Bugfix : Bug with terms translation has been fixed. * Bugfix : Bug with ‘www.’ in the URL has been fixed. * Bugfix : Bug with GeoIP locale switching has been fixed. * Bugfix : Bug with navigation menu saving has been fixed. * NEW : Ability to set language slug position in the URL has been added. * Update : The compatibility with Visual Composer has been improved. * Bugfix : Bug with subdirectory WordPress installation has been fixed. * Bugfix : Bug with multiple lang slugs in the link has been fixed. 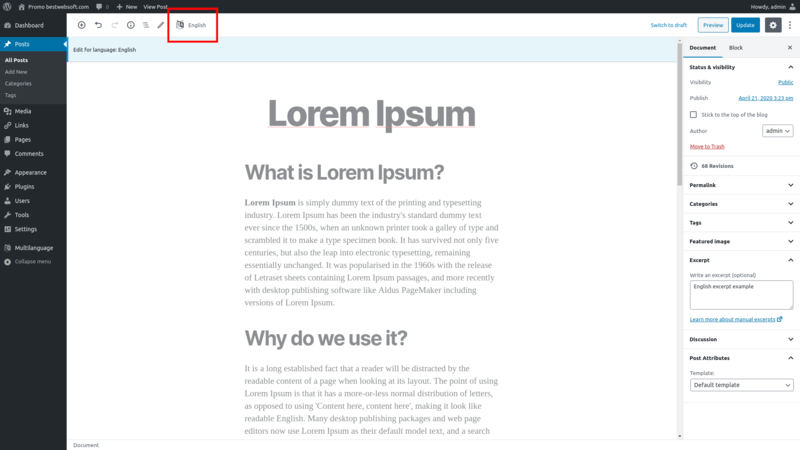 * Bugfix : Bug with multiple text editors on the page has been fixed. * Update : The list of languages has been updated. * Bugfix : Bug with website’s default language switching has been fixed. * Bugfix : Bug with website search has been fixed. * Bugfix : Bug with hidden current language tab during post editing has been fixed. * Bugfix : Yoast SEO compatibility issue has been fixed. * Bugfix : WP-CLI compatibility issue has been fixed. * Bugfix : Bug with hiding link slug for the default language was fixed. * Update : Czech language file was updated. * NEW: Ability to change a language flag icon was added. * NEW: New language switcher type was added. * NEW: Translation Saving Mode was added. * Bugfix : Bug with IP determination and website language switching was fixed. * Bugfix : Bugs with search were fixed. * Bugfix : Bug with excerpt saving was fixed. * Bugfix : Wrong link formation bug in the menu Language switcher was fixed. * Bugfix : Bug with saving WooCommerce product short description was fixed. * Bugfix : Compatibility Bug with Advanced Custom Fields was fixed. * NEW: Compatibility with Visual Composer Backend Editor and Divi builder was added. * NEW: Compatibility with Page Builder by SiteOrigin was added. * Bugfix : Bug with selecting languages for menu was fixed. * NEW : The Arabic language file was added. 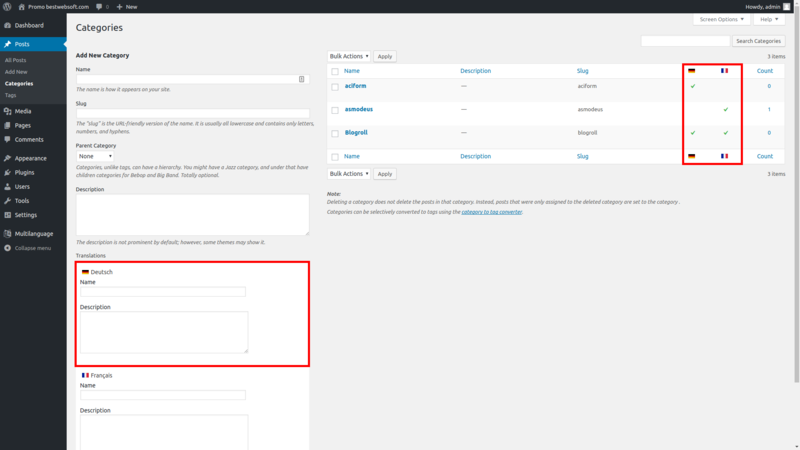 * NEW : Ability to translate custom fields. * NEW: Compatibility with PDF & Print by BestWebSoft plugin. * Bugfix : Bug with displaying the list of languages was fixed. tag for an ability to stylize content of certain language. * NEW : Ability to select for which language display the widget. * NEW : Ability to translate widget’s title. * NEW : Ability to display aligned languages switcher in the site menu has been added. * Bugfix : Bug with displaying alternative page links was fixed. * Bugfix : The conflict with WooCommerce REST API was resolved. * NEW : Ability to create different menus for different languages. 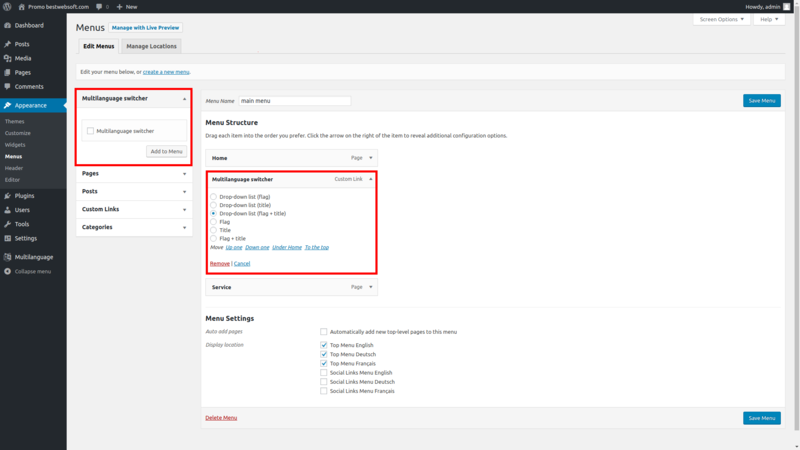 * NEW : Ability to add languages switcher into site menu. 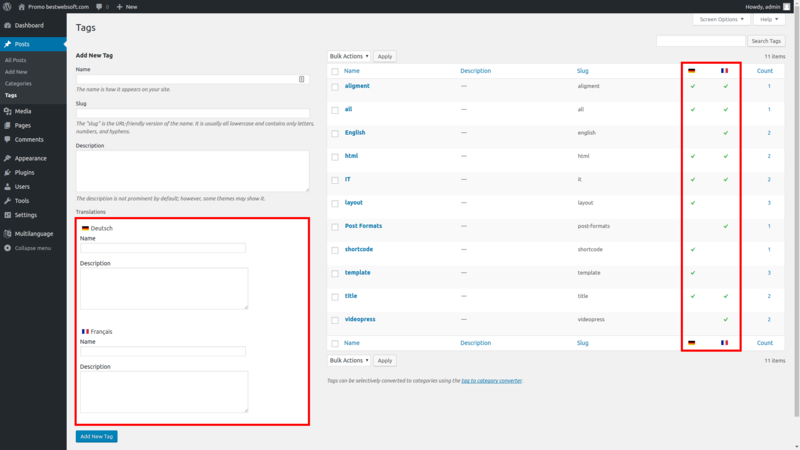 * NEW : The column which displays translation availability has been added to the posts and taxonomies list. * Update : Displaying Language switcher widget as Drop-down languages list was changed. * NEW : The Czech language file was added. 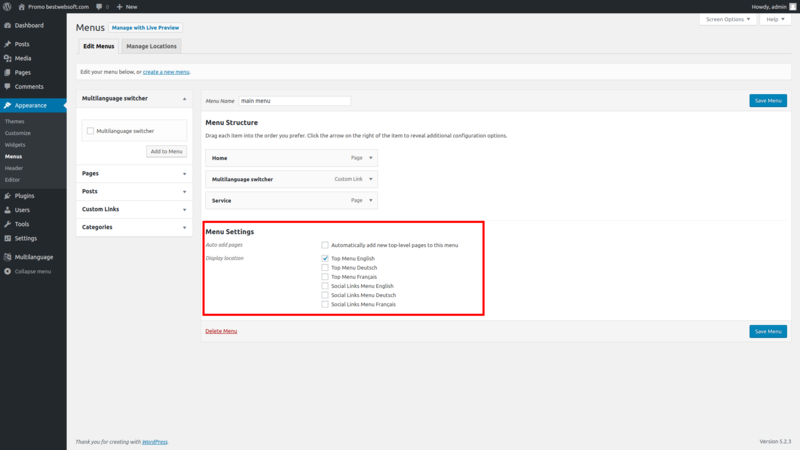 * Update : Saving data for languages in admin panel has been improved. 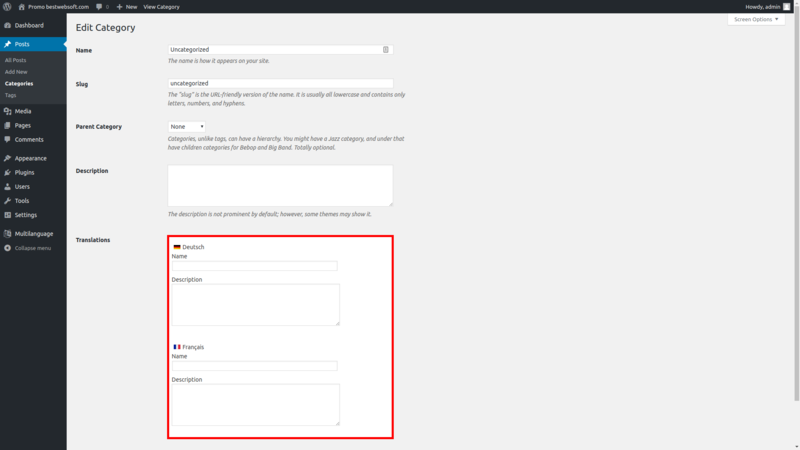 * NEW : Ability to add links to your current page for each language from your site into the tag has been added. * NEW : Ability to hide link slug for default language has been added. * NEW : Ability to add language code only as link parameter for chosen language has been added. 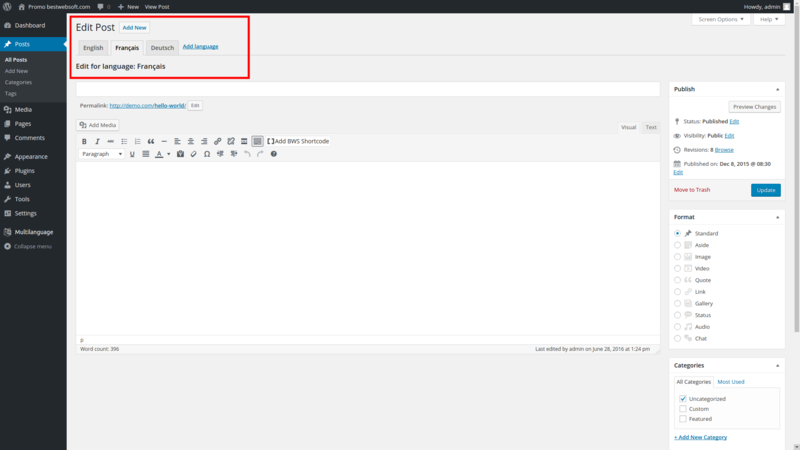 * NEW : Ability to translate taxonomies for custom post types has been added. * Update : GeoIP functionality has been updated. * Update : Widget with languages switcher has been updated. * Bugfix : Bug with creation of column “post_excerpt” in tables plugin`s database has been fixed. * Bugfix : Bug with saving of language switcher options has been fixed. * Bugfix : The bug with default searching was fixed. * Bugfix : We fixed the bug with missing argument 2 for mltlngg_the_title_filter. * NEW : A button for Multilanguage shortcode inserting to the content was added. 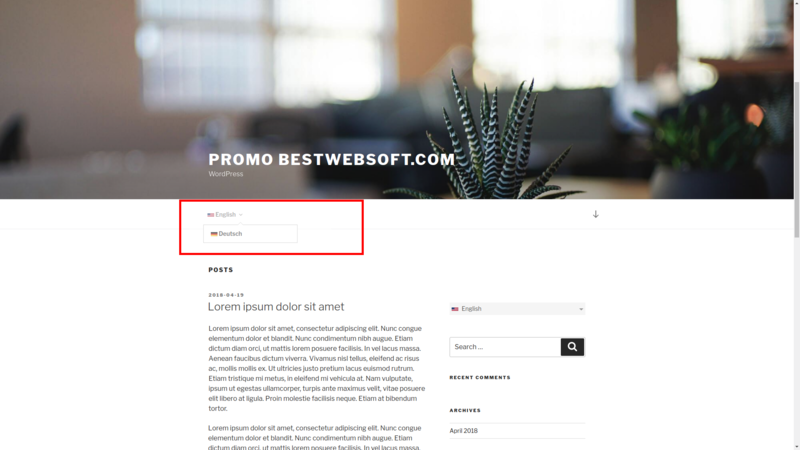 * NEW : Ability to default searching by the language which is currently selected for the site or all available languages. * New : We added new languages. * Bugfix : We fixed not saving data error when switching between tabs. * Bugfix : We added post updating when the plugin is deactivated for some time. * Bugfix : We fixed the bug with adding Russian language. * Bugfix : We fixed the bug when using the plugin with the php version less that 5.3. * Bugfix : We fixed the bug when using editor in the frontend. * Bugfix : We fixed the bug with read more tag when using it on pages. * Bugfix : A bug with displaying video was fixed. * Bugfix : A bug with compatibility with the Promobar plugin was fixed. * Bugfix : Page address changing bug when and address features letter combinations from the translation slug was fixed. * Bugfix : Display of categories translation in the Dashboard was fixed. * Bugfix : Access to the files in WP root directory bug was fixed. * Bugfix : Excerpt translation bug was fixed. * Bugfix : A bug with displaying messages when language chart is being edited was fixed. * Bugfix : A bug with compatibility with Booking System (Booking Calendar) plugin was fixed. * Bugfix : A bug with uploading images in NextGEN Gallery plugin when working with Multilanguage was fixed. * Update : An image for en_US was changed for the USA flag, and en_GB language was added. * Update : We updated all functionality for wordpress 4.2-RC2. * NEW: We added shortcode and the strings to paste into the template source code. * Bugfix : Fixed pagination for default permalinks. * Bugfix : Fixed author link for default permalinks. * Bugfix : Bugs with page title is fixed. * Bugfix : Private and password protected posts display was fixed. * Bugfix : We fixed errors while using read more tag. * Bugfix : Bugs that occurred if SERVER_PORT was present in the website address were fixed. * Bugfix : Error that occurs when WP is installed in a subfolder was fixed. * Bugfix : We fixed errors while front page displays a static page. * Bugfix : We removed constant __DIR__. * Bugfix : We fixed errors while saving custom posts. * Release date of Multilanguage.